2016 developed into a strong year for M&A transactions: The number of transactions with Swiss involvement rose by 3.4 per cent compared to the previous year, from 350 to 362 deals. The transaction volume grew by US$34.1 billion, or 40 per cent, over the previous year. The acquisition of MultiPlan Inc for US$7.5 billion by Hellman & Friedman and Leonard Green & Partners was the largest PE transaction in 2016 with Swiss involvement and was announced in May 2016. EQT Partners AB won the bid for the Swiss travel services company Kuoni Reisen Holding Ltd7 with a US$1.4 billion offer. 2016 registered five IPOs compared to 2015, which saw three IPOs, and 2014, with six IPOs. Hence there was an increase in IPOs in 2016. However, the number is still much lower compared to the 10 IPOs observed in 2007. Save as otherwise provided for in the articles of a company and unless a Swiss company (in the form of a corporation) is listed on a Swiss or foreign stock exchange, the board of directors has sole but reasonable discretion in, and is responsible for, setting up the remuneration of its members and the remuneration of the executives of the company. In practice, often the shareholders’ agreement among the main shareholders provides for the key elements of the management equity incentive scheme to be implemented by the board, on the one hand to fix the size of the scheme and thus the maximum dilution to be suffered by the shareholders, and on the other to ensure the alignment of the interests of the shareholders and the board as well as the management. Stock option plans are the most common management incentive schemes. However, in some cases stock plans with vesting periods or reversed stock plans with call options for the benefit of the company in bad-leaver cases are also used. With respect to board and management compensation – including equity incentive arrangements – of Swiss companies that are listed on a Swiss or foreign stock exchange, the Swiss Federal Council adopted, effective as of 1 January 2014, the Ordinance against Excessive Compensation with respect to Listed Stock Corporations (OaEC), providing for enhanced corporate governance rules and control over shareholders regarding the remuneration of board members and executives of companies. In particular, any remuneration of the board of directors or the management is subject to (annual) approval of the shareholders’ meeting. It is important to mention that the compensation to be approved by the shareholders’ meeting encompasses all types of compensation that the board or the members of the executive management receive, whether directly or indirectly (i.e., also any compensation for activities in entities that are directly or indirectly controlled by the issuer, e.g., in the event that the management of the issuer is formally employed by a subsidiary, irrespective of whether such subsidiary is domiciled in Switzerland or abroad). In addition to the mandatory vote by the shareholders on compensation, the OaEC provides for the preparation of a remuneration report by the board that must disclose all compensation awarded by the issuer, directly or indirectly. Furthermore, the OaEC restricts certain types of compensation to the executive management and the board. In particular, sign-on bonuses (‘golden handshakes’) and severance payments (‘golden parachutes’) are disallowed, to the extent not owed to a leaving executive, for a notice period or fixed-term employment agreement not exceeding 12 months. PE transactions in Switzerland not involving a public company do not have timing considerations that differ from any other private Swiss M&A transaction, such as merger control notification requirements or other governmental approvals for certain regulated industries, in particular banks. For public to private transactions, however, timing is provided by the Ordinance on Financial Market Infrastructure and Market Conduct in Securities and Derivatives Trading (FMIA), pertaining ordinances – in particular the takeover ordinance – and by the takeover board. The prospectus pertaining to the offer shall be published within six weeks from the pre-announcement (if any) of the envisaged public takeover. Following a period of 10 trading days, the offer period can be fixed anywhere between 20 to 40 trading days following the 10 trading-day cooling-off period. After the announcement of the interim result, the acceptance period must be reopened for another 10 trading days. In the case of a competing offer, the offering periods are prolonged by the takeover board to allow the shareholders an effective choice between the two offers. A squeeze-out can be envisaged if the bidder has obtained 98 per cent of all votes within three months of the end of the acceptance period after the public offer, and at the price of the public offer. If the 98 per cent threshold under the FMIA is not met, but the bidder holds 90 per cent or more of the shares and the voting rights of the target company, the bidder may effect a squeeze-out merger in accordance with and within the timeline provided for in the Swiss Merger Act. Depending on the financial needs and life cycle of the target company, the transaction structure might be different. If the target company is looking for new capital to fund its operations, the PE investment is often effected by way of a capital increase on the level of the target company. In such case, the PE company usually sets up a special investment vehicle (financed by the investors and often leveraged with debt raised from banks), which will act as a shareholder subscribing the new shares in the target company, or the investors will be allowed to act directly as new shareholders of the target company and subscribe the new shares themselves. In these cases, the transaction is usually based on an investment and subscription agreement entered into by the new shareholder and the target company. Further, the investor and new shareholder often have an interest that not only the target company but also existing (majority) shareholders become party to such investment agreement in order to secure potential warranty claims of the investor and new shareholder, which may less enforceable, if at all, if only given by the target company. To carry out the capital increase, the shareholders’ meeting and the board of directors of the target company will have to take the necessary corporate resolutions, which will have to be registered in the competent commercial register. If there is no obvious financial cash need of the target company, but the PE investment aims to seek to generate operational improvements to increase the value of the company, which shall be realised through exiting the deal after the holding period, the transaction may also be structured by a simple share deal. In such case, the main acquisition document for Swiss deals is the share purchase agreement. The share purchase agreement is generally governed by Swiss law, but may be subject to foreign law if so required by a party. In such case, provisions of Swiss public policy provisions are nonetheless applicable and fully enforceable. The Swiss Code of Obligations provides for special representations and warranties and certain guarantees automatically applicable to the object of a sale performed under Swiss law (i.e., the shares themselves, as opposed to the underlying business of the target). The buyer of the majority or minority stake therefore has an interest in ensuring that the share purchase agreement provides for extended representations and warranties with regard to all aspects relating to the assets, liabilities and agreements as well as the business of the target company. In the case of a breach of a warranty under the share purchase agreement, the buyer is typically allowed to claim damages for the breach. Such right may be preceded by the right of the other party to remedy the breach itself on behalf, and at the cost, of the counterparty. The buyer is sometimes allowed to reduce the purchase price. Swiss law also provides for a statutory right to rescind the purchase agreement in the event of a severe breach or a fundamental error, duress or fraud, but these rights are often contractually limited or excluded – to the extent permitted – by the parties. The purchase agreement usually provides that the right to take legal action based on a breach of representations and warranties by a counterpart is time barred within 12 to 36 months after the completion of the share purchase agreement. However, if a controlling or minority interest is sold by a PE company, the purchase agreement very often provides for only very limited, fundamental representations and warranties, and such claims are usually time barred after six to 12 months, while any claims the buyer may have against the PE seller are limited to a certain position of the purchase price, which is secured with an escrow solution. d control of the sponsor over the investment vehicle. A PE deal involves three different entities: the investors, the investment vehicle and the investment manager (sponsor). The choice of location for the investment vehicle depends mainly on the tax incentives and framework provided by the jurisdiction where the vehicle is located. The chosen jurisdiction shall, to the maximum extent possible, reduce or limit tax leakages between the target company and the deal investors. Typical structures often involve multi-level acquisition vehicles with Swiss and Luxembourg level companies, especially for acquisition finance structures in Switzerland, benefiting from the double tax treaty between these two countries. The location of the investment vehicle is also important for the investors, since the distributions made by the investment vehicle to the investors (or their investment vehicles) are subject to taxation. To reduce or limit tax leakage between the distributions of the target and the investors, the investment vehicles used to be based mainly in the Cayman Islands, with Bermuda, Jersey and Guernsey also being used to some extent. Recently, depending on the investor base, a certain preference for onshore structures that provide for a minimum regulatory supervision of the fund managers can be seen. Investment vehicles are mainly organised as limited liability partnerships providing for tax transparency, limitation of liability for the investors acting as limited partners and control of the investment structure by the promoter as general partner, usually incorporated in the form of an LLC to limit the liability of the promoter. In principle, no fiduciary duty is owed by shareholders of a corporation save for a violation of the law or the articles of association of the company. The Swiss Code of Obligations provides that a limitation of the shareholders’ rights in breach of the law or the articles, or for any improper reasons, discrimination against shareholders that is not justified as being in the company’s interests or the withdrawal of the profit orientation of the company without the consent of all shareholders may be considered by Swiss courts to be illegal, even if it has been approved by a proper majority of shareholders. In addition, Swiss case law provides that a majority shareholder may have a fiduciary duty towards the minority shareholders in certain specific cases. Executives and members of the board of directors of the company have a specific duty of care and duty of loyalty in relation to the company. Such executives or members of the board are liable in relation to the company and shareholders for loss or damages resulting from the breach of such fiduciary duties. The duty of loyalty provides that directors may not act in their own interests when acting as director of the company, and further prohibits directors from competing against the company. The duty of loyalty provides that directors shall act for the company’s interest in the best possible way. To prevent deadlock situations in situations where a conflict of interest exists, since Swiss law is silent on the topic, companies are advised to adopt an internal set of rules providing for ways to deal in such context. If the board of directors has lawfully delegated the day-to-day business to a third party such as the management, the board is, however, exempt from liability provided that it can show that the management has been carefully selected, instructed and supervised. There is in principle no fiduciary duty of the directors in relation to third parties. However, the directors may be held liable towards creditors of the company for breaching their duty to file for bankruptcy in a timely manner once the company has used up its equity due to losses (or if other means are not undertaken to remedy such financial status), unless creditors are willing to cover such losses by subordinating loan claims in the amount of such losses. The vast majority of the exits made in Switzerland are by trade sales, followed by secondary sales and IPOs. When structuring the acquisition of a Swiss target, promoters try to implement provisions allowing the promoter to get rid of convertible instruments and preference shares by providing mandatory conversion upon the occurrence of an exit event. The contractual arrangements in co-investments in Swiss companies generally include share transfer provisions. The goal is to restrict the sale of a stake held by a co-investor in the company to an undesirable transferee during the investment period, but at the same time ensure that the minority shareholders have an obligation to co-sell or have the right to co-sell along with the majority upon an exit event, by implementing tag-along, drag-along and squeeze-out clauses. 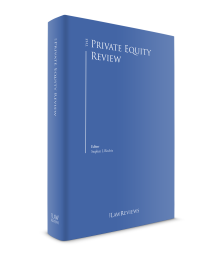 A PE firm’s ability to exit its investment is therefore very much depending on the terms of the investment documents and especially the shareholders’ agreement. For an exit by way of an IPO at the SIX Swiss Exchange, certain criteria need to be satisfied, inter alia, that the company shall have a certain minimum size. In addition, an adequate free float of the company’s shares is required (generally, at least 25 per cent of the issuer’s outstanding shares in the same category must be listed and must represent a capitalisation of at least 25 million Swiss francs). A redemption of shares by a company or a share buy-back programme may also be implemented in a Swiss company, but must follow strict conditions and thus are usually not considered for an exit as they are restricted to 10 per cent of the issued and outstanding capital. Payment of the shares shall be made out of the distributable reserves of the company only (unless the acquired shares are cancelled immediately after the repurchase by way of a formal capital decrease procedure) and the shareholders shall be treated equally. PE firms in Europe are increasingly using highly leveraged loans with few safeguards for lenders. Issuance of covenant-light loans, which typically have high yields and loose limits on debt levels relative to earnings, is set to exceed last year’s all-time high, according to sources in the industry. The following debt financing arrangements are usually put in place for acquisition financings: senior (secured) credit facilities; junior (unsecured or junior-secured) credit facilities or mezzanine facilities; and subordinated (non-interest-bearing) shareholder loans. Leveraged buyouts generally involve senior and junior debt in the form of revolving and term credit facilities provided by commercial lending institutions (banks) on a syndicated or non-syndicated basis. In addition to or instead of junior debt, PE investors typically provide financing in the form of mezzanine debt or subordinated loans, or both. Collateral is sought at the level of the target company most of the time, but the debt arrangements are likely to be granted to the acquisition company becoming the target’s parent at closing. Upstream collateral and cross-stream collateral are subject to certain restrictions. Essentially, to be valid, such collateral shall be allowed by the articles of association of the target, be in the corporate interest of the target and be at arm’s length as has been reaffirmed by the Supreme Court in a recent decision. Should the granting of the collateral be considered not to be at arm’s length, the collateral would be considered as a hidden distribution to shareholders and would be required to comply with distribution of equity rules. Equity distribution rules provide that the amount so to be collateralised shall be limited to the amount that the target could distribute to its shareholders as a dividend at such time as enforcement is requested. This limitation is sometimes referred to as the ‘free equity limitation’. Depending on the type of transaction and the competition among investors, it has become more common for PE investors to tie the commitments for future financing on specific milestones, and to request detailed representations and warranties both from the target company as well as from the existing (founding or managing) shareholders. In addition, provisions relating to anti-dilution, protection and potential exit procedures are often part of well-negotiated financing arrangements. In the case of additional third-party debt financing, attention must be paid to the interplay of the conditions precedent to closing under the various agreements. No statutory margin requirements apply directly in connection with the credit facilities used for PE transactions. Indirectly, minimum capital requirements for banks may have an impact similar to margin requirements. In going-private transactions, the offer prospectus shall contain information regarding the financing of the offer, as well as a statement from the auditors that the bidder took all necessary measures so that the financing will be available at closing. Timing provisions in PE deal agreements are key terms in current times. The circumstances of most transactions call for a separation of signing and closing, and the parties will require each other to fulfil certain conditions before closing. Acquisition agreements will most of the time provide for a long stop date, failing which the agreement will terminate automatically. There is further an increasing use of termination fees in the form of liquidated damages to mitigate the risk that the deal breaks. In public tender offers, the bidder and the target can agree on a break fee, provided that the clause is drafted in a way that does not oblige the shareholders to accept the offer. Break fees must be disclosed in the offer documents. As a general rule, they should not substantially exceed the cost incurred by the bidder in connection with the offer. When it comes to purchase price terms, PE deals offer a panel of various mechanisms. In the past, ‘locked-box’ mechanisms have been widely used by PE firms for their acquisition deals, especially prior to the last financial crisis. In the outcome of the financial crisis, a different mechanism, employing closing accounts to have more visibility and certainty on the purchase price to be paid at closing, has increasingly been used by PE professionals. A ‘locked-box’ mechanism provides for price certainty for the seller, and price and time efficiency as it avoids lengthy pricing discussions and high expert fees after completion of the transaction. It is usually used for stand-alone entities in comparison with groups in multiple jurisdictions. The price may not be changed after signing. Therefore, anti-leakage provisions and indemnification provisions are usually included in the acquisition arrangements. These measures will prevent the seller from syphoning funds out of the target prior to closing. PE transactions – to the extent not related to shares listed on a stock exchange – are not supervised by a regulatory body in Switzerland (save for the applicable competition law supervision), but PE sponsors are subject to a regulatory supervision if performing their activities from Switzerland. In the wake of the Alternative Investment Fund Manager Directive of the European Union, the Swiss regulation changed as from 1 March 2013; since that date, PE sponsors for Swiss and non-Swiss collective investment schemes are subject to the supervision of the Swiss Financial Market Supervisory Authority (FINMA). FINMA is an institution under public law with its own legal personality. It is responsible for implementing the Financial Market Supervision Act and financial market legislation. FINMA supervision over PE managers of related (Swiss-based) collective investment schemes is not required to the extent that such sponsors have qualified investors and one of the following conditions is met: the PE sponsor has assets under management (including with leverage) under 100 million Swiss francs; the PE sponsor has assets under management (excluding leverage) of 500 million Swiss francs for closed-end funds with a five-year lock-up period; or the investors and the PE sponsors are part of the same group. Listed companies and corporations are not subject to supervision when their shares are in registered form. any other legal requirements are met. In addition to a control of FINMA prior to the authorisation, the PE sponsor is supervised by FINMA throughout the performance of its activities. To obtain the required licence from FINMA, the PE sponsor of a Swiss collective investment scheme must demonstrate that it fulfils a number of financial requirements (for instance, a fully paid-in share capital of at least 200,000 Swiss francs and compliance with capital adequacy requirements, capped at an amount of 20 million Swiss francs) and personal criteria (in particular a fit and proper test, somewhat similar to the one applicable under Swiss banking regulations). Swiss PE sponsors are subject to ongoing supervision by FINMA, which benefits from extensive audit and inspection rights as regards regulated entities. The Swiss regulatory regime is based on a ‘dual supervisory regime’, which requires regulated entities to appoint a FINMA-recognised auditor. The task allocated to such auditor is to verify whether the regulated entity complies with all applicable legal, statutory and regulatory requirements. The auditor’s findings are set out in a report, which is delivered both to the regulated entity and to FINMA (the long form report). 1 Alexander Vogel, Andrea Sieber and Samuel Ljubicic are partners at Meyerlustenberger Lachenal. The information in this chapter is accurate as of February 2017. 2 KPMG, Media Release: Chinese Offensive in a lively M&A year, 17 January 2017. 3 KPMG, Clarity on Mergers & Acquisitions, January 2017. 5 KPMG, Media Release: Chinese Offensive in a lively M&A year, 17 January 2017. 7 Alexander Vogel and Stephanie Maurer: Valuation of privileged voting shares in a public offer, ILO Corporate Finance/M&A. 8 Ethos Study on the 2015 Swiss Proxy Season ‘Generalversammlungen 2015, Vergütungen und Corporate Governance der Unternehmen des SPI’, October 2015. 9 Pursuant to the Ethos Study, only 28 per cent of the companies have implemented a retrospective vote (at the end of the financial year) on the variable remuneration. 10 Alexander Vogel and Samuel Ljubicic, Relevance of Minder Initiative to M&A transactions, ILO Corporate Finance/M&A. 11 Alexander Vogel and Samuel Ljubicic, Mergers and Acquisitions Report 2015, IFLR. 12 Urs Gnos and Markus Vischer, Private acquisitions in Switzerland: Overview, www.practicallaw.com/1-526-6249. 13 Andreas Rötheli and Stephan Erni, Switzerland unlocked, IFLR Private Equity & Venture Capital. 14 Binder Corporate Finance M&A OUTLOOK Schweiz, January 2017. 15 KPMG, Clarity on Mergers & Acquisitions, January 2017.